The trend with this summer’s blockbusters seems to be a focus on light and enjoyable fun, compared to last year’s drab and overly-dark mood pieces (Man of Steel and The Lone Ranger being the most obvious poster children). From How To Train Your Dragon 2 to X-Men: Days of Future Past to even Brett Ratner’s Hercules, it seems that studios are finally starting to listen to audience and critical pleading that not every major film needs to be as gritty or serious as The Dark Knight, and instead need to be as enjoyable as possible, no matter how out there the source material or ideas may be. This is where Guardians of the Galaxy comes in, a blockbuster that is SO out there and SO strange that it may just well be one of the more entertaining films you’ll find this summer. The latest entry in Marvel’s ever-expanding cinematic universe, Guardians of the Galaxy is a completely bonkers ride from start to finish. Action scenes come out of almost nowhere at times, its alien civilians have skins that are all of the colours of the rainbow, the plot is very basic yet somehow hard to follow at times, and there’s a talking raccoon with a machine gun in the middle of it all. As you can imagine, pretty much everything that one can find in this movie can be used as damning evidence that it should be committed to whatever asylum can be brave enough to admit it. But it doesn’t really matter at the end of the day, because we – and by extent they – are having so much fun soaking up the insanity and having a blast with it. Props to writer-director James Gunn who has managed to achieve the impossible: make a coherent tale set in deep space involving aforementioned talking raccoon as well as a giant tree creature that says a maximum of five words during the entire film, and give it not only the right amount of laughs and high-octane action we expect from this kind of film but also the beating heart that it so desperately needed. 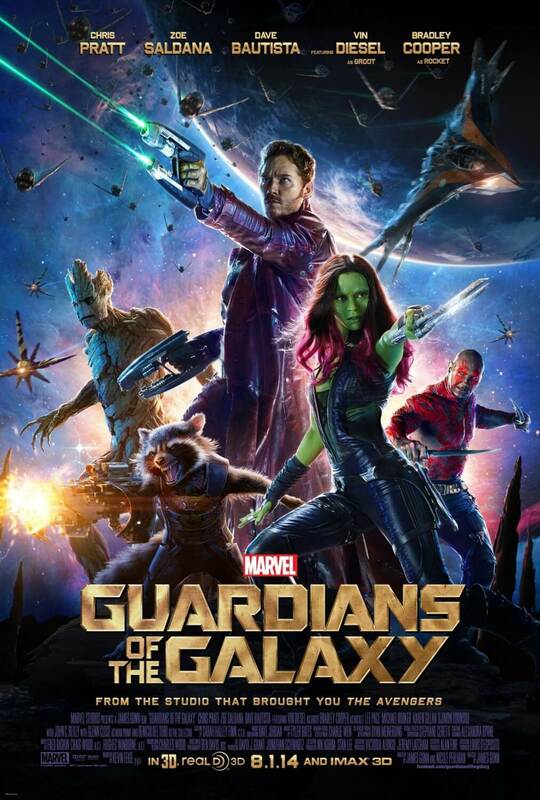 Gunn has partially achieved this by hiring a quintet of actors to play the titular guardians, from Chris Pratt’s sure-to-break-big-after-this-movie display of charm and charisma to Dave Bautista’s surprisingly firm grasp of deadpan humour all the way to the effective voice work of Bradley Cooper and Vin Diesel as their own respective characters (Zoe Saldana’s green-skinned Gamora proves to be the weaker link of the group; nothing wrong with her performance, but her character isn’t that much different to what she may have played before in other films). While the five leads all give memorable and sympathetic personalities to an otherwise thuggish collection of characters, the rest of the cast suffers from limited screen time which especially disappoints considering both the size and amount of recognisable faces. Lee Pace’s big baddie Ronan barely registers as a character and falls in line with the worryingly numerous stock Marvel antagonists, while Karen Gillan’s much more interesting Nebula is mostly sidelined but promised (we presume) to return for the sequel. The only other actors given a decent amount to do are John C. Reilly who, particularly in the third act, acts as an unexpected heart and The Walking Dead’s Michael Rooker as a blue-skinned criminal with probably the most awesome use of whistling you’ll see all year. Any others are just simply wasted, including Djimon Hounsou as a rather pointless extra baddie, Glenn Close as the leader of a group of peacekeepers, and especially Benicio Del Toro as, well, Benicio Del Toro who had been built up in a previous mid-credits sequence in Thor: The Dark World only to have him act as a heavy exposition dump in this flick. Here’s hoping he pops up in future Marvel movies as a major presence, otherwise that would have been all for nothing. Gunn clearly likes to rely on his actors and characters (or at least, the ones with the most on-screen presence) to carry the film, but also lends a keen eye and imagination to the film’s overall design. Boasting some truly impressive production design and make-up artistry, as well as some high-tier visual effects work, it truly is a beautiful-looking movie. Nearly everything has some form of personality to it even if it’s just the tiniest element – a criminal planet named Knowhere, for instance, is formed within the severed head of a titan; instantly, you can think of a dozen creative possibilities with just that set-up alone, and for all we know Gunn takes advantage of all of them. Even when the action can become so overbearing, it’s still a heap of fun to look at. Despite the climax being formulaic for a Marvel movie – city in danger, heroes must stop it – it never ceases to amaze with what it throws at us (a net formed by starships to contain the villains is particularly cool). Maybe that’s the only way Guardians of the Galaxy could have worked; just give it a Gunn and it will do the rest.